What type of cow do veggie burgers come from? A week ago, I hosted a vision board party for a large group of friends. For several hours, we brainstormed, designed and created our personal vision boards for 2013. These boards list our own affirmations, goals and visions for this year. They’re meant to serve as visual reminders every day, so they contain a lot of visual clues, which we cut out of magazines. To find the right visual clues for my board, I went through a lot of magazines. I had specific ideas of what to use for each goal I listed, and I managed to get the right images in the end. But I have to admit the process was long and tedious. What made it more enjoyable and surprising? The amount of magazine ads I found that featured cows! So this week I’ll be highlighting the cows that sell you things. Have you ever noticed the selling power of cows? I’ve mentioned several times on this blog and I’m about to deliver you with a few more samples. Today, I’m featuring an ad from the vegetarian food company Lightlife, which sells soy-based meat replacement foods (we love their hot dogs!). Lightlife is introducing a new line of veggie burger. Can you think of the best spokeperson for this new veggie burger? 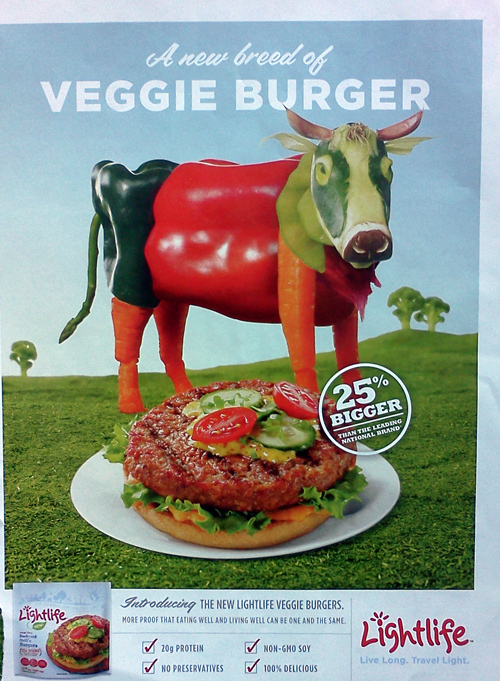 How about a veggie cow? It looks so good, I love it! Next Post Are you ready to drink milk that’s over the moon?